Punxsutawney Phil may predict spring in Pennsylvania on Ground Hog Day, but the biggest spring tradition in Boston is the Walk For Hunger. The Walk represents an outpouring of support in helping an estimated 500,000+ food insecure people that reside in Massachusetts. The flowers are in bloom, the trees are budding, and more than 40,000 people walk along a scenic route in support of this tremendous cause. The Walk For Hunger is sponsored by Project Bread, a mainstay local charitable organization that has raised tens of millions of dollars since its inception, with the goal of reducing hunger in the state. The Walk alone has generated more than $105 million in donations since the first event in 1969, with almost 1,000,000 people participating and 20,000,000 miles walked. Funds generated by the Walk support many emergency food programs including soup kitchens, food pantries, food banks, food salvage operations, and a hunger phone hotline. Nearly 44 million emergency meals are provided annually from funds donated to the Walk. The 10-mile route of the Walk is very scenic and appealing. Walkers can start at any point along the route by registering at the numerous checkpoint locations. 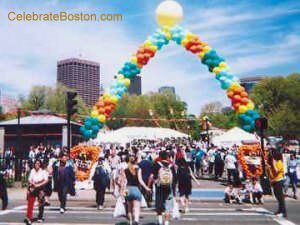 The route begins at Boston Common, travels west down Beacon Street, travels over the Mass Ave Bridge to Memorial Drive in Cambridge, then loops back over Eliot Bridge down Storrow Drive, and finally back to Commonweatth Ave and the Common. The 5k Run travels west down Beacon Street to Kenmore Square and loops back to the Common via Commonwealth Ave. Starting in 2019, a new 3-mile walk route was added to make participating in the Walk for Hunger more accessible for all. Walkers can make the entire 10-mile journey, or stop at any time. Shuttle buses to Bosotn Common are available for those who decide not to walk the entire distance. Along the route, music or entertainment is presented at many places, free water is available at all checkpoints, snacks and juice are given away at the half-way point, and there is free ice cream at the finish line. Prospective walkers must complete a pledge sheet which is published online, and also distributed via retail locations. $500 in pledges is a suggested goal for each walker. 5k Run event check-in is at Boston Common between 6:00 am and 7:30 am with a start time of 7:30 am. Walk for Hunger event check-in is at Boston Common between 6:00 am and 9:30 am with a rolling start time until 9:30 am. Walkers should be prepared for prevailing weather, as the event takes place regardless of conditions. The event sponsor recommends dressing in layers, wearing walking shoes, carrying an extra pair of socks, bringing a hat, sunglasses, or sunscreen, if necessary, and carrying a snack and a cell phone where possible. Inline skates, skateboards, and bicycles are prohibited. Wheelchairs and strollers are permitted. Online donations for this great cause are encouraged if one is unable to attend the event.